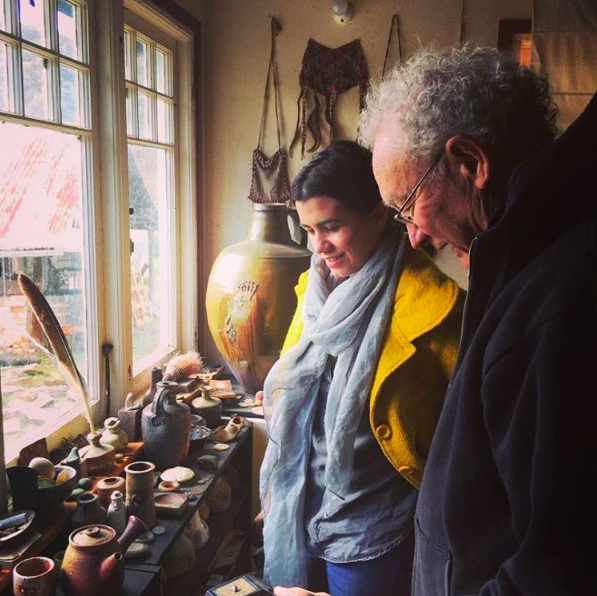 As an artist and a new member of the Orana Arts team, this was my first experience of visiting the residence and workshop of an established artist. Winding up the drive, I was transported back in time. Surrounded by nothing but spectacular bush, with water-soaked earth under foot and only the sound of birds above. Even then I knew that this visit was going to be great. Welcoming us into their home were the artist and his wife, alongside some wallabies and parrots who were watching curiously by the doorstep. Chester and Jan immediately inspired me; the wealth of knowledge they possess surrounding their own practice and their passion for all cultural artistic practices is impressive. I was immersed in collections of artefacts and artworks, all with an amazing story. Over the next hour or so I would learn of Chester’s adventures and what inspires him. I learnt that when in China I must go to the street markets and look on the ground. It’s there that I will find the most extraordinary fragments of ceramics. We bonded over a mutual interest in Maori culture and design, with Chester filling in blanks that I had been hoping to fill for some time. I was able to touch with my hands artefacts that were hundreds of years old whilst discussing Chester’s practice. His works have a raw beauty to them that I can see reflects the landscape he inhabits and the places he has been. What an honour it was to sit and sip tea with such a fantastic artist. I pulled myself away from the treasures that line every windowsill and wall so that we could experience the workshop. Scattered pots, cups and teapots line the grassed slopes of his yard. ‘It’s better to leave them there than on a table’ he said. ‘The wombats just knock over everything otherwise.’ I had a quiet chuckle to myself, thinking of the trials and tribulations for a country artist verses a city one. Next we checked out Chester’s kiln and then a shack made of gorgeous orange-rusted pressed tin of all different patterns and textures. It is here that he keeps his pots both finished and mid-process. To my delight I spied more found objects lining the windowsills. After a lovely morning I left the property hoping that this would not be my last visit. As an artist, it was refreshing to meet someone who has created such a harmonious life with his art. Everything worked as one; he is never far from what inspires, his practice just off the back steps. It was a captivating experience that confirmed why I create art and why I want to pursue a career supporting artists. In 2017 I will be off to China with my family. While I am there I will be visiting the street markets just as Chester advised and when my partner asks me why I’m searching the floors I will respond with ‘I’m doing a Chester Nealie’.